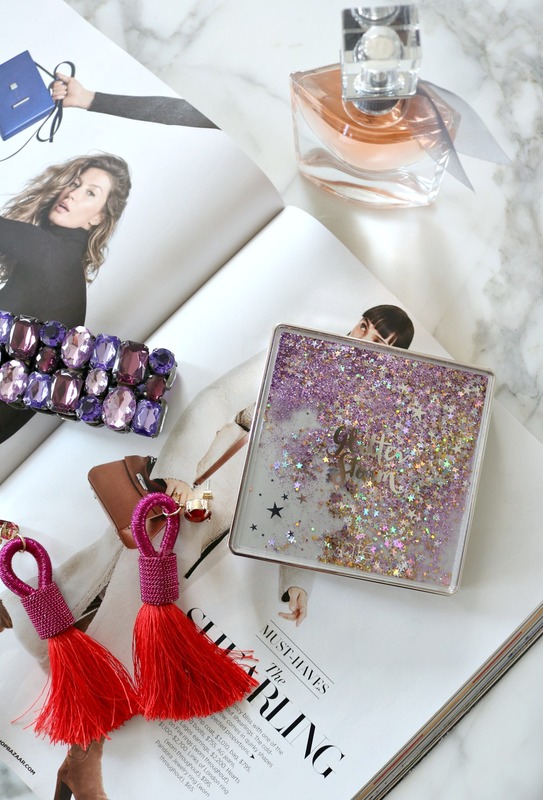 When I first spied the Ciate Glitter Storm Eyeshadow palette in a YouTube video, it was instantly love at first sight. 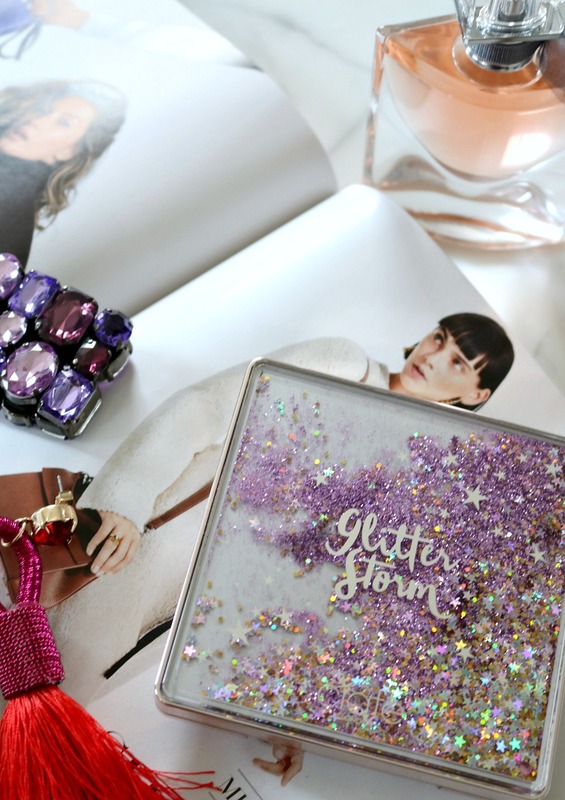 I mean, who wouldn’t want an eyeshadow palette filled with glitter, sequins and sparkling stars? Some may say it’s foolish to buy an eyeshadow palette simply because of its over-the-top and glitzy packaging. But that someone certainly wouldn’t be me because I was adding this to my cart on Sephora’s website faster than you can sing the alphabet. Back in the day (the 90’s, hello), I used to be enamored with these pens filled with glitter and sequins much like this pretty lil’ palette. As such, when using this I feel very much like I’m transported back to my childhood. 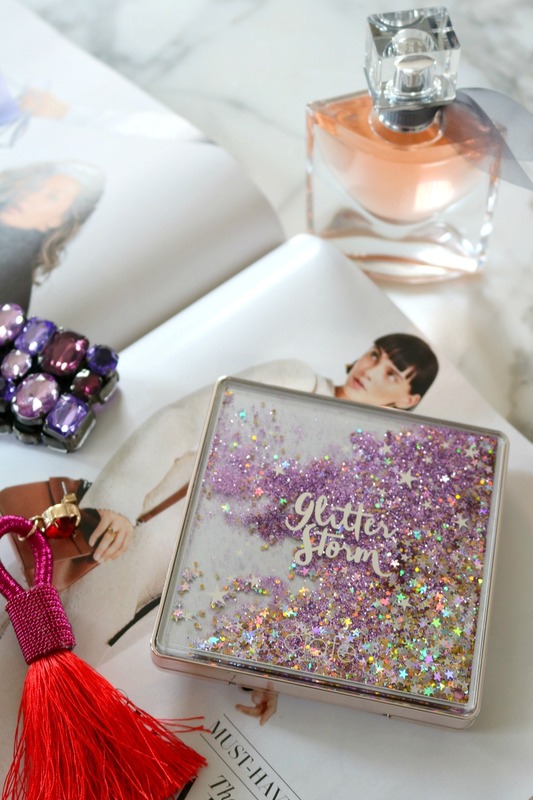 The inside is every bit as beautiful as its outside, but the Ciate Glitter Storm eyeshadow palette’s packaging is so next level…that it’s worth a couple extra minutes of ooh-ing and ahh-ing before getting to the shadows. Aren’t you in love? Me too. Perfect packaging (that can only be described as “goals”) aside, we of course have to discuss the nine shadows that await you inside the Ciate Glitter Storm eyeshadow palette. 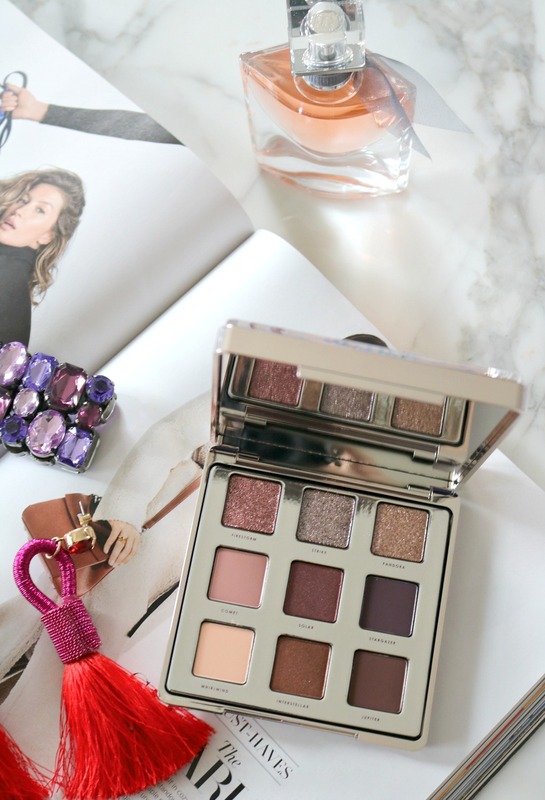 Inside and out, the Ciate Glitter Storm eyeshadow palette is sure to catch your eye. To help you out, though, I’m going to give you a full run down of my experience with these shadows. I really appreciate a good mix of finishes in a palette and while the Ciate Glitter Storm Eyeshadow palette absolute has a lot of GLITTER to it — the shadows also include a nice mix of matte and satin shades. I feel “glitter” eyeshadow palettes usually omit standard blending shades, but Ciate definitely has that covered meaning you can create a multitude of eye makeup looks with this one palette alone. No doubt, Firestorm, Strike and Pandora are the showstoppers of the palette as top-notch glitters. They are perfect for the festive season upon us and work surprisingly well as everyday shadows to boot. 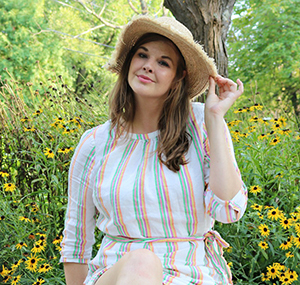 Since they’re more neutral shades – they can easily be worn in the daytime and even to the office if you like. I did note that it was much easier to control these glitter shades and build up the product to my liking by using just my finger. If you do prefer using a brush, I recommend dampening it to have a little more control of the glitter. Not to say stray specks of glitter on your face is a bad thing…but if you’d like to keep it on your eyes, a wet brush will do better justice. This was my very first time trying out a Ciate eyeshadow palette…and I’m mighty impressed with how easily these shadows are to blend. I’ve worn the palette everyday for a week now and have had a lot of fun using the nine shades to craft various makeup looks. Initially I was nervous the shadows wouldn’t blend out well, but I was happily surprised to see how smoothly these work together. With a mixture of finishes inside, the Ciate Glitter Storm eyeshadow palette definitely had my interest peaked when it came time to swatch these shadows. I found that each shade was incredibly pigmented with fairly consistent quality throughout. The deep brown Stargazer shade did seem a touch more “dry” than the other shades, make it somewhat patchy. But because of how easily the shadow blends, I didn’t run into any trouble when working with that shade on my eyes. How Long Do the Shadows Last? To be fair, I have worn the Lorac Pro eyeshadow primer everyday beneath these shadows…but I’ve been happy to see the shadows last a solid 10 hours. I’ve worn these shadows on long days at the office, to Thanksgiving celebrations and Black Friday shopping. At all of the above occasions, I ended the day happily surprised by how well the shadows hold up. Even the glitter!! Any Negatives to the Palette? Per usual, do take a little more caution when using the glitter shades. I found that if I’m not careful when topping off my eyeshadow look, glitter will get in my eyelashes and make my mascara come out looking clumpy. It’s a pretty annoying thing when it happens so be sure to go a bit slower when working with the glitter shades themselves. 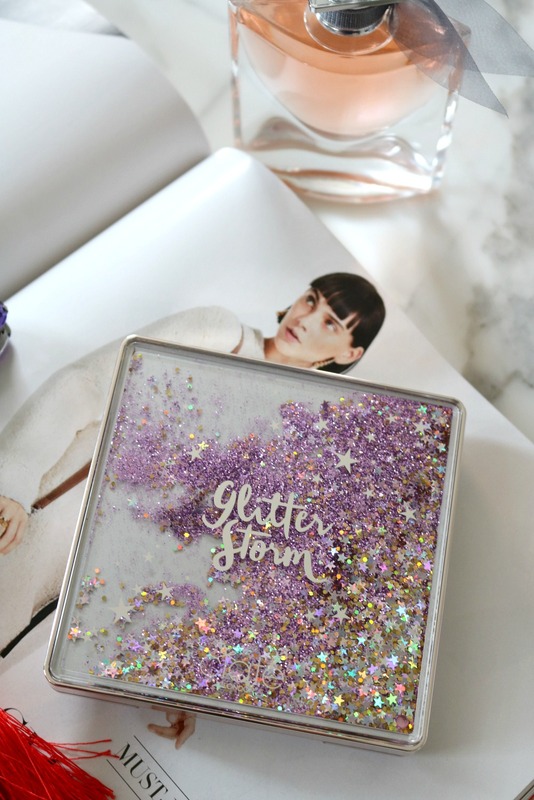 I gotta say, while it was definitely the packaging that seduced me into buying the Ciate Glitter Storm eyeshadow palette…it’s the eyeshadows themselves I’ve fallen most in love with. For my first time trying any makeup from Ciate London, I’m left feeling pretty impressed. The eyeshadows are all richly pigmented and blendable and have the perfect mix of finishes. I also really like the thought the team put into the color selection of the Glitter Storm palette. 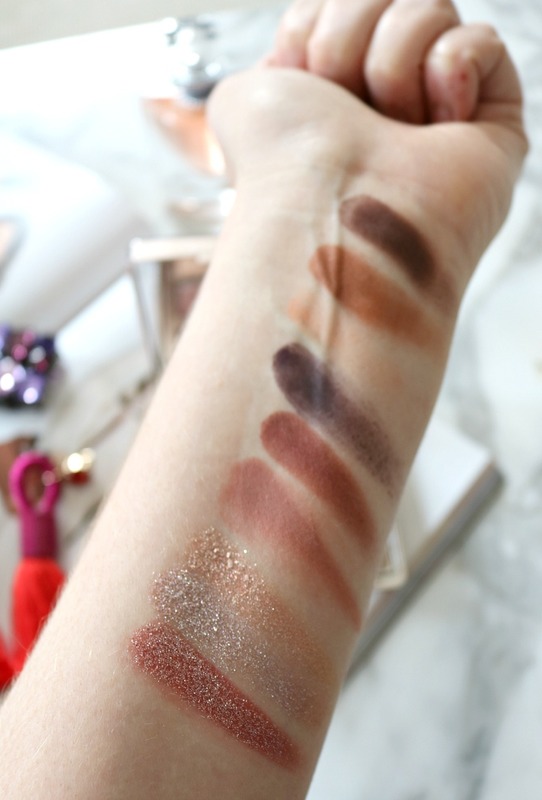 The shades are so rich and decadent, making this my ultimate go-to palette for the holiday season. If you’re in the market for some uber fun holiday makeup, I think you won’t regret giving this a try. Thank you so much for reading! If there’s a question you have that I didn’t think to answer – please drop me a comment below and I’ll get back to you asap.